Rebecca Nagy is a communications intern with North Carolina Sea Grant. She recently graduated from North Carolina State University with a degree in English and a minor in environmental science. Recently, this question has been at the center of a debate about what people should be told to do if caught in a rip current. Some research, including data from the West Coast, suggests that if you are caught in a rip current and simply stay calm and float, you will be brought back to shore. But how often does this actually happen in North Carolina? And what about the beachgoers caught in rip currents that do not circulate back to shore? Spencer Rogers, North Carolina Sea Grant coastal construction and erosion specialist, is answering these questions. 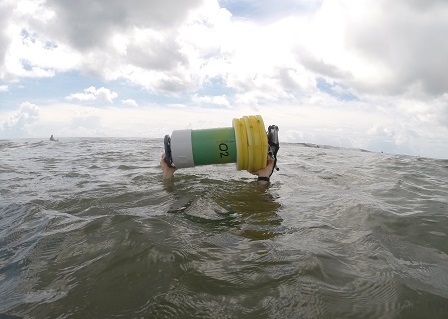 Along with University of North Carolina Wilmington graduate student Cobi Christiansen and a variety of partners, Rogers deployed data-logging drifters on beaches in New Hanover County and along the Outer Banks in summer 2014. The drifters recorded the velocity and frequency of rip currents, including those that circulate back to shore and those that eject drifters into deeper water. North Carolina Sea Grant’s Spencer Rogers, University of North Carolina Wilmington graduate student Cobi Christiansen and University of New South Wales coastal geomorphologist Rob Brander led the rip current study. Photo by Mike Spencer/Wilmington Star-News. “Beaches are pretty safe places for recreation but the primary exception on most ocean beaches is rip currents,” Rogers says. “On most days, they have a relatively low velocity. But on certain days and certain shoreline conditions, they get to very dangerous velocities, faster than an Olympic swimmer can swim,” he continues. “We believe that an offshore-directed velocity higher than 1.6 feet per second can get people into trouble,” Christiansen explains. As part of his master’s thesis, Christiansen worked with Rogers to build the drifters and analyze the data collected from their deployments. Christiansen also tested a model to more accurately forecast when dangerous rip current days might occur. This method is known as a probabilistic predictive model. Christiansen has compared his model to others, such as the one used by the National Weather Service. He uses different predictors to fine tune a model that would work best on specific beaches. This is why bathymetry — the study of the “beds” or “floors” of water bodies, including the ocean — is integral to rip current forecasting. Each beach is unique, and this is particularly true of North Carolina’s beaches, which have slopes facing various directions due to the complex system of barrier island beaches and shorelines. These differing characteristics make universal rip current forecasting a challenge. With funding from Sea Grant, Rogers and Christiansen made 22 drifters using readily available plumbing materials, foam, 5-pound barbells and a GPS unit that measures the drifters’ position every second. Understandably, some beachgoers were a little curious about these bright green-and-yellow contraptions. “I was actually more surprised when someone walked by and didn’t say anything,” Christiansen says. Rogers took advantage of this interest and passed out rip current brochures and answered beachgoers’ questions. Drifters were deployed on 12 days in summer 2014. A few of those days drew national media attention with coverage from Good Morning America, Associated Press and McClatchy Company, and locally by newspapers and television. UNC-TV featured the research on an episode of North Carolina Now, at science.unctv.org/content/predict-rip. Half of the deployment days produced usable data and three of those days were associated with dangerous rip currents. “Data from the West Coast showed very high frequencies of rip current circulation cells, which imply if you simply float, within five or 10 minutes, you had a pretty good chance of getting back to shallow water where it was safe,” Rogers notes. 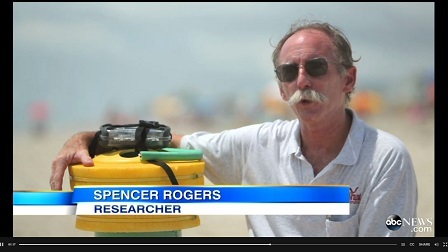 The rip current research was featured on ABC’s “Good Morning America.” Source ABC News. Data analysis from California beaches showed that 10 percent of the drifters were ejected into deeper waters and did not recirculate back to shore. “What threshold of ejections can you tolerate? If you’re only losing 10 percent of the people, is that an acceptable reason to say float? It’s not,” Rogers says. The circulation cells also were found in N.C. rip currents. The circulation sometimes continued for several circular laps but more often than not, ended with an offshore ejection. “If there is any real likelihood of an ejection, you pretty much have to tell people to try and get out of it,” he explains, reaffirming the long-told advice to stay calm but also to begin to swim parallel to the shore until out of the rip current, which normally is fairly narrow in width. Rob Brander, a coastal geomorphologist from the University of New South Wales in Sydney, Australia, joined the North Carolina team for some of the deployments. A longtime collaborator with Rogers, Brander is known internationally as Dr. Rip for his rip current research. Rogers, Brander and other researchers were concerned about whether to recommend people simply float or to swim parallel to the shore, which has been seen as the traditional safety message. “What we’ve seen in North Carolina, and from what Brander has seen in some of the Australian rip currents, are high levels of ejection. Thus, simply telling people to float is potentially dangerous,” Rogers concludes. There was one rip current fatality in North Carolina in 2014 and at least one already in 2015. There have been 63 since 1999, and the state ranks third overall in rip current fatalities since 1999, according to Wayne Presnell, meteorologist in the Marine, Tropical and Tsunami Services Branch at NWS headquarters. Rip currents are caused by breaking waves that pile up water along the beach. When that water escapes into deeper water, it creates a current that is directed offshore. The U.S. Lifesaving Association reports 80 percent of all surf rescues are related to rip currents. There is not always one telltale sign of what a rip current looks like. At times, they can be characterized by darker water or a flat spot between two waves. A rip current may be evident if debris are spotted moving offshore. Because of the variable nature of rip currents, it is challenging to educate every single beachgoer to be able to spot one. But beach visitors can be aware of daily rip current conditions before they step onto the sand — by checking for NWS forecasts and educational materials to help them know the best course of action if caught in a rip current. For the earlier West Coast research, the drifters were 8 feet tall and weighed 40 pounds. Jamie McMahon of the Naval Postgraduate School in California and Brander refined that design and reduced the size and weight of the drifter to 2 feet and 20 pounds. They used a less expensive but equally effective commercial GPS unit that did not require an antenna. This research marked a shift in focus from researching rip currents in terms of sediment displacement to public safety. “Most previous research was in coastal processes — looking at where the sediment was going but was not looking at deaths being caused or other beach safety issues,” Rogers explains. Rogers says the North Carolina data provide important information for beach safety professionals. “The more information we as a group can compile about rip currents, the better we can protect and inform beach patrons,” notes Simon Sanders, ocean rescue supervisor for Carolina Beach. Sanders’ ocean rescue group was a key collaborator in the research. Other partners for Sea Grant research included the UNCW Center for Marine Science; NWS Wilmington Forecast Office; ocean rescue programs in Carolina Beach, Wrightsville Beach, Kill Devil Hills and Kitty Hawk; UNCW Surf Club; Wrightsville Beach Longboard Association; Tony Silvagni Surf School in Carolina Beach; CB Surf Shop in Carolina Beach; and the University of New South Wales. “As a lifeguard organization, we are on the beach daily observing the changing conditions of the climate and the effects it has on the ocean. We can directly see the correlation between rip currents and the safety of our beach patrons,” Sanders adds. This research can make a difference in the way lifeguards do business. The research suggests that if you can keep people calm and can go after the most exhausted swimmers and keep them safe, the group as a whole has a pretty good chance of being in a circulation cell and getting back to shallow water, Rogers explains. “An untrained rescuer should never make the attempt without some type of float — a boogie or surf board, even a cooler,” Rogers adds. This summer, some of the North Carolina-built drifters will hit the road. Rogers will keep a third of the drifters with him in Wilmington. Several will be loaned to colleagues in South Carolina and others will be stationed farther north in North Carolina. Other Sea Grant programs have expressed an interest, such as New Jersey and Delaware. Rogers suspects that others will follow. The GPS unit on each drifter records location data every second. Photo by Kurt Christiansen. As rip current research continues, Rogers says the most accurate forecast is still a lifeguard with a cell phone or other communication device, who can then put up a warning flag reliably. And Sanders wants all beach visitors to know lifeguards are there in multiple capacities. “Lifeguards are not only on the beach to respond to emergency situations, but also to inform the public about current conditions. Talk to your local lifeguard when enjoying the beach this summer and always look out for your fellow friends and family while participating in water activity,” he adds. For more information from North Carolina Sea Grant on rip currents, visit ncseagrant.ncsu.edu/ripcurrents. Go to the inside back cover for a the Break the Grip of the Rip!® poster. Many coastal forecast offices for the National Weather Service offer daily rip current outlooks, but scientists are working on improving these models. Together, the National Sea Grant network, NWS and the National Ocean Service collaborate to improve forecasting and provide the most useful information possible for beachgoers. “There are several factors that we look at when rip current forecasting — wind direction and speed, swell direction, swell height and swell period, along with any tidal factors, especially if there is a full or new moon,” explains Sandy LaCorte, meteorologist at the weather forecast office in Wilmington. “Taking into account all of these factors, forecasters are able to determine whether there is an enhanced risk of rip current activity — specifically moderate or high. If neither, we will carry a low risk of rip currents as there is always the possibility of a rip current,” LaCorte continues. Once a local Surf Zone Forecast is issued, LaCorte and others will speak with Ocean Rescue Groups along the coast to verify information. Greg Dusek, a National Ocean Service oceanographer, is working with NWS to implement an improved rip current forecast that can be used by local forecasters. This work began when he was a graduate student at the University of North Carolina at Chapel Hill. Originally working with Dave Elder, supervisor of ocean rescue at Kill Devil Hills, Dusek compared records of time and place of rip current rescues with lifeguard observations of rip currents and wave data collected by the U.S. Army Corps of Engineers. Combining these data with measurements of the shape of the surf zone, also known as surf zone bathymetry, they created a statistical rip current forecast model. By including data such as wave height, direction and water level into this model, they can calculate the likelihood of hazardous rip currents occurring. “Initially, after some testing, this model proved to be a significant improvement compared to models used in the past by NWS,” Dusek explains. “Functionally, this model is an improvement because it allows us to provide a location-specific rip current forecast for days into the future,” Dusek says. This summer, NOAA and local partners will collect high-definition rip current footage. This video will be a valuable tool for the media and public information officers to use to promote public safety regarding rip currents. For the most up-to-the-second information possible, look for the lifeguard flags on the beach and talk with your local lifeguard. North Carolina partners continue to promote rip current safety by posting signs and providing magnets, sharing daily rip current outlooks from NWS offices in Newport/Morehead City and Wilmington, N.C., and Wakefield, Va., and utilizing online safety materials via the national portal at ripcurrents.noaa.gov. No matter where you decide to visit the beach, you can view the surf zone forecast for your area at ripcurrents.noaa.gov/forecasts.shtml. Magnets, signs and brochures with the Break the Grip of the Rip® national safety message are available from North Carolina Sea Grant. For individual orders, call 919-515-9101. Communities, vacation rental firms and others with bulk orders also can call 910-962-2490. HAVE YOU BEEN CAUGHT IN A RIP CURRENT? 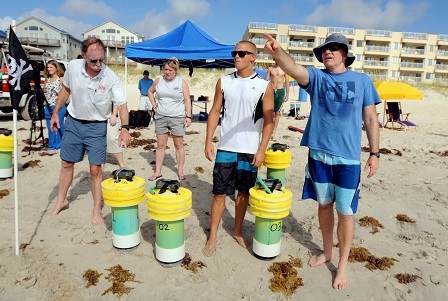 Rob Brander is conducting a rip current survivor survey, which can be found online at www.ripcurrentsurvey.com. Volunteers can anonymously answer a few quick questions about their experience being caught in a rip current. The survey was developed by the University of New South Wales with input from members of the National Weather Service, the National Sea Grant network, the United States Lifesaving Association and the Great Lakes Surf Rescue Project. The results from the 10-minute survey will be made available to these organizations and others who are trying to help educate the public about rip currents and how to survive them. This article was published in the Summer 2015 issue of Coastwatch.